Thriving for better sales and higher conversion ratings for your site? Well, pop up banner broadcasting will do the job for you! Pop up banners are the greatest engaging aids that one can carry out on a website to raise the sales at a rapid speed. Easily turn your website more successful and get great profit via alluring pop up banners. The best thing about pop up banners is that they do not collaborate with users’ actions on your site. It allows users/visitors to navigate on your website while the pop up banner is there, showing your offer. Isn’t it cool? Including a pop up banner stand on your website, you quickly get the attraction of the visitors. Add to this a beautiful design that will suit your website and catch visitor’s eye and you’re done. You can have any content you wish in a pop up banner. Display time-limited offers, announce sales or offer help. It’s all up to your groove! Just follow some non-official rules to reach better success with retractable popup banners. Make sure you make an inevitable offer in your pop up banner content. The banner material means more than you may consider. The design should be super-great! Make sure the look of your pop up banner fits your site style and the banner displays are attractive enough to catch visitors’ eyes. Do not rush! It’s not a good practice to show the roll up banners just the very moment the visitor goes over your site. Give them a little time and show your offer with some delay. Targeting your audience will be a great idea. Show your pop up banner to specific audiences specifically, considering their individual preferences. Don’t be to persistent. Allow visitors to escape the pop up banner whenever they want. Pop up display should be escapable. Pop up banners, or roll up banners call them however you wish, are the ultimate means for showing engaging offers on your website. Ever heard about Countdown pop up banners? Well, this is the perfect combination of an enticing offer in a popup, rolled up with a feeling of rush. 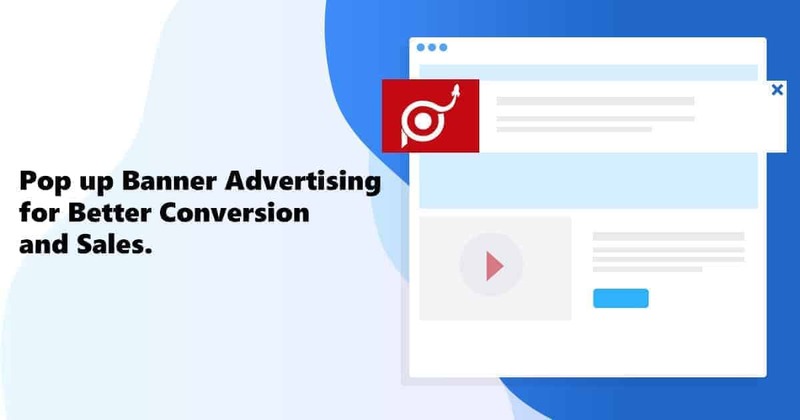 If you’re an e-Commerce website owner, let’s say, you should know well that sales are the inseparable part of your ad campaigns. And what’s the best way of announcing sales on the site? Pop ups, for sure, specifically, pop up banners. You can include any content you wish in your pop up banners. But there’s some really powerful element that will literally increase your sales for good. 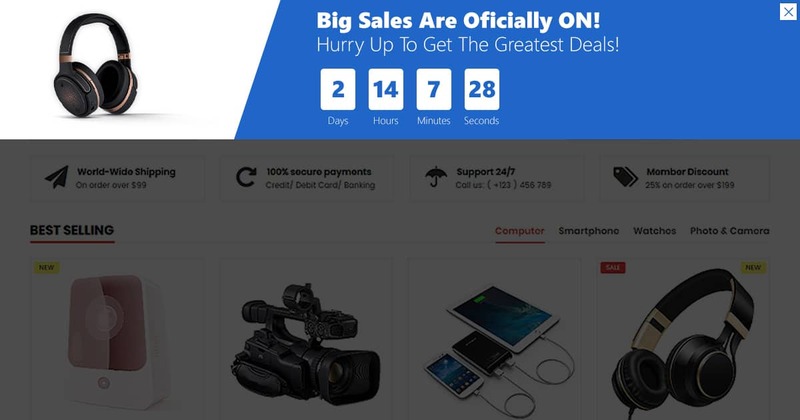 Countdown popup element is that super tool that will perfectly speed up the shopping process on your site, so you will get more sales in a shorter period. Just imagine, there’s sales offered via a pop up banner and that’s perfect. But add to this a nice countdown element that will demonstrate the visitors that the offer is actually time-limited. This is it! You can just sit back and watch how your sales will boost in a couple of days, hour by hour! There’s something that may improve this whole pack even more. Use various targeting options, like geo-targeting for better engagement results. You may have various sales that will more interest users from the United States, for example. This is why you can target your offers in the pop up banner via geo-targeting options. CTA (call to action) buttons are very useful and productive tools that one can use in a popup. The same is for pop up banners. You are totally free to display your special offer in the roll up banner providing a CTA button in it to direct users to specific actions. It can be a free seminar offer, or an online course or an offer to start a service, or a registration popup button anything you wish! The point is to move the interest of the users so that they click on the button to finalize your desired action. So, when the visitor reads the text and decides to give it a chance, a simple button in the popup banner will direct them to a page for registration, or maybe download the course. One of the chiefest things you should take in count when operating a website, is to demonstrate your users that you do care about them. Offer support in all possible ways. Support can be offered through a pop up banner as well. You can include a button to a contact form popup or a call button. It’s up to you. Help is needed all the time, no matter what service you offer on your site. Be that a digital product, some creation service or an online store, users will always need help. The point is to be there when they need it. This is a secret practice which will not only fascinate your consumers more but also raise your sales. You may not imagine, but an answer to a seemingly simple question may bring you more sales. So just be there and show support. An essential aspect in this practice is to not be offending and provide a selection for choice to the visitors. When displaying the pop up banner with a help offer, you’d better take in count that there may be some visitors who don’t need help. This is why you should provide options for escaping/closing the roll up banner. Online marketing today is one of the most powerful means of promoting any type of business. Pop up banners are one of the most effective means of showing an advertisement or other offers in the clearest way. Consider the points discussed in this post and you’ll have the results of conversion on your site that you would not even dream about! 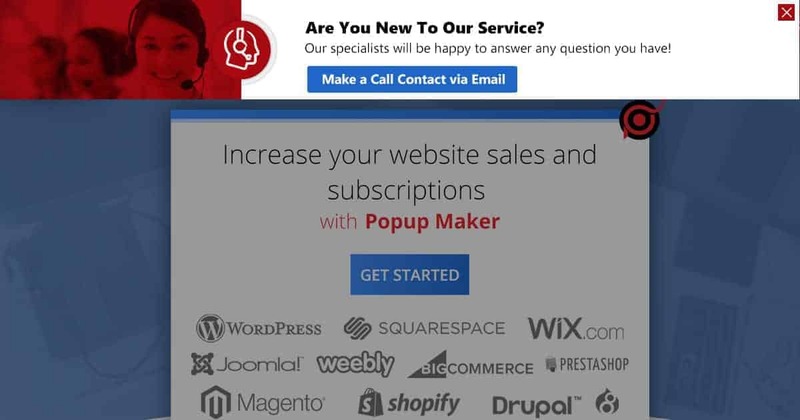 Previous Post:Popup Maker Web Push Notification Tool Released!